The Wharf is a $1.5 billion redevelopment of the Southwest Waterfront with 26 land acres and a similar amount of water acreage with 2/3 mile of shoreline by the Hoffman-Madison Waterfront team, headed by PN Hoffman and Madison Marquette. The illustrative plan can be found here. 30% of the first 500 residential units will be affordable - half of the affordable units will be for those earning up to 30% of AMI and the other half for those earning up to 60% of AMI. 20% of units over 500 will be reserved as workforce housing for those making 100% and 120% of AMI. The affordable units will blend in with market-rate housing. Phase I - from 7th Street to the Fish Market, including Wharf Hall, co-generation plant, 7th Street Park & Pier, Transit Pier, and District Pier. Will include 3 hotels with ground floor retail, office, three apartment buildings, two condominium buildings and Capital Yacht Club. 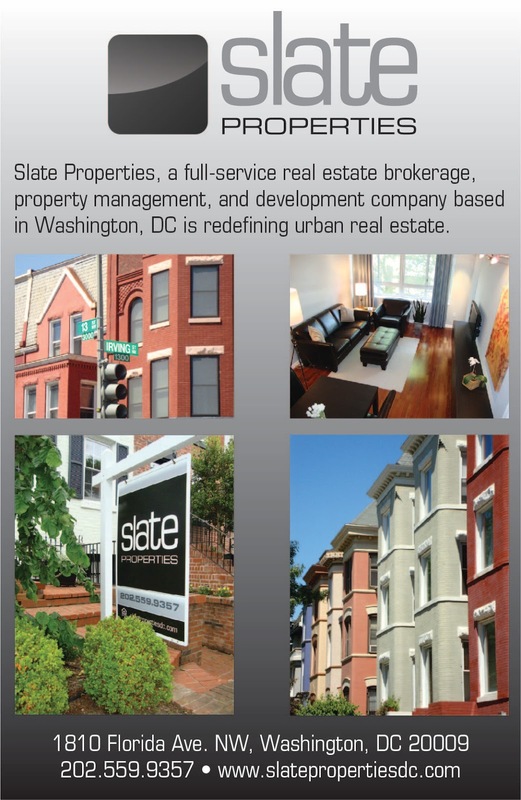 Phase II - from 7th Street to P Street Park. Will include residential, office, hotel, retail and commercial pier. District Pier will serve as the terminus of 9th Street from Maine Avenue and will jut out into the Washington Channel. This will be the main civic space of the waterfront, where tall ships can dock, the dock master building will be located at the end of the pier. This will also be the area that will have the most programmed activity. City Pier is designed to be the ceremonial entrance to the city by water. This section of the waterfront is near the fish market, which will be refurbished. In addition, a new farmer's market will be built north of the fish market to replace the head house market that once existed in the area back in the 1930s. A seasonal market, brewery, cafes, picnic tables, and restaurants will be located in this informal space and a couple of barges will be added to this area. 7th Street Park will be at the terminus of 7th Street and will be more formal in nature than Market Square. It will be a grassy area with lots of trees and the retail space adjacent to the park will be reserved for higher-end restaurants. There will be a pedestrian pier with perhaps a gazeebo and kayak rental facilities. Across from Arena Stage will be M Street Landing, an open space that connects the waterfront to Arena Stage. This area will have 1-2 story buildings so Arena Stage can serve as a showcase building visible from the waterfront. There will be a new traffic light on Maine Avenue in front of Arena Stage and a water feature - perhaps an ice skating rink - that will be near the Washington Channel. This area is seen as being a fun area with less formal restaurants and family-oriented retail. M Street Landing will also serve as a staging area for the cruise ships that will all operate at the commercial pier nearby. Maine Avenue will become a neighborhood street, with ground floor convenience goods retail running along its length, such as dry cleaners, bakery, pharmacy, etc. Each side of Maine Avenue will have a travel lane on the left, a second travel lane that shares space with a streetcar line, and a parking/loading lane. A row of street trees will separate the road from a 10-foot wide bike lane and a 15-foot sidewalk, so buildings will be 25 feet away from the street. Tour buses will be moved to Maine Avenue near M Street Landing so cruise ship patrons have easy access to the commercial pier. 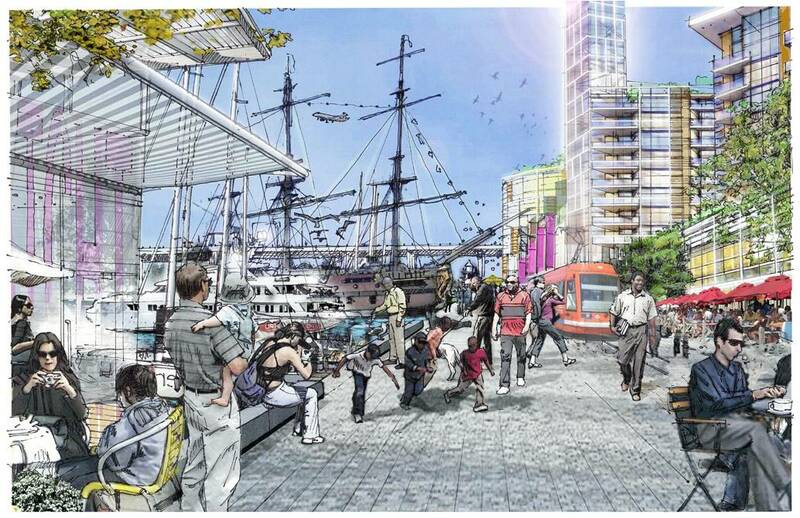 The main attraction at the Southwest Waterfront will be The Wharf, which is the promenade that will run the length of the waterfront from Market Square to M Street Landing. Water Street will be removed and replaced with Wharf Street. The promenade will be 60 feet wide broken into three equal sections and in most places will be at "elevation 13" or 13 feet above the surface of the channel. The 20-foot section closest to buildings will be for outdoor seating. The middle 20-foot section will be Wharf Street, with limited vehicular access. The 20-foot section closest to the shoreline will be for pedestrians. 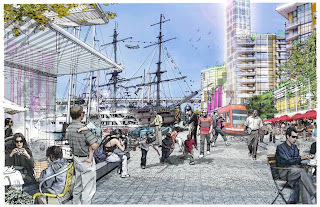 The Wharf looks a bit chaotic, but that is the intent of the planners at EE&K Architects. Other public spaces planned include Waterfront Park, which will be a large park space where the tour buses currently idle; P Street Park; The Grove, which will be a more intimate space near the Gangplank Marina; The Mews, Theater Alley, Transit Plaza and Pier; and Club Plaza. The northwest side of the waterfront will be the more lively area while the activity and buzz starts to die down closer to the existing neighborhood on the southeast side. Most of the buildings will be perpendicular to The Wharf to minimize blocked views to the waterfront. Taller buildings will also be positioned to avoid a wall effect along the waterfront and enhance view corridors. The entire development is aiming for LEED-ND (Neighborhood Development) and individual buildings will be seeking LEED-Gold or Silver. The Planned Unit Development (PUD) process will begin in fall 2010. Construction of Phase One is supposed to begin in 2014 with a groundbreaking date set for March 19. Construction should last 42 months, but the whole development will be built in 7-8 years.